Kathmandu day tour and weekend trips of sightseeing, hiking, rafting, bungee jumping. Kathmandu and its surrounding hills offers many day tours and weekend trips like sightseeing, hiking, day rafting trip, paragliding, Everest sightseeing flight, Bungee jumping, mountain biking and more. Kathmandu valley is prefect combination of culture and nature to offers a day trip and active weekend holidays to see Himalayas and immerse in its culture. For those on a business trip, conference or volunteering, there are ample outdoor activities or weekend trips in and around Kathmandu. The seven groups of medieval Newari architecture together make Kathmandu an UNESCO Heritage site. A day sightseeing tour of Kathmandu gives a good perspective into the cultural life, spiritualism and history of civilization across Himalayas. The Shivapuri national park and other lush hills make perfect day hike or short trek for the weekend in Kathmandu. The glacial Rivers like Trishuli and Bhotekoshi make great White-water rafting day trip both for beginners and veteran rafters. For those with very limited time, it just takes one hour in the morning for ‘Everest sightseeing flight’. Walk thorugh the well protected evergreen forest. Hermitage, monastery and spiritual site of Bagdwar. Difficulty: Moderate to Difficult with altitude gain of 600 m from the base that takes about 5 hrs to the top and back. Rugged trail with stone steps throughout the forest. View of Ganesh Himal, Mt Manaslu, Langtang towards north and sprawling Kathmandu valley towards south. Jamacho Stupa and a monastery at the top. There are also meditation caves of Siddha Nagarjuna. 160 m high jump from a bridge connecting a deep cut Himalayan gorge is one of the longest free fall in the world. 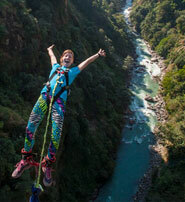 The scenic journey northeast of Kathmandu on the highway to Lhasa, Tibet makes a day bungee jump trip even exciting. 520 sq. km Kathmandu valley is located in middle hill with Himalayas just about 18 km crow flying. While the medieval and ancient civilization of Kathmandu make it to the list of UNESCO World Heritage sites, lush green hills and countryside in the outskirt provides model Himalayan trekking. There are several short trips / treks you can do from Kathmandu for weekend break or in less than a week. Kathmandu shares its northern border with Shivapuri National park which connects with Langtang National park. Extension of road have made it possible to drive to the base of some of the great walking peaks like Ama Yangri (3,300 m) and Surya Peak (5,145 m) – Godaikunda (4,380 m). Contact us for inquiry or visit Short Treks in Nepal . The 1 hr. fixed wing Himalayan sightseeing flight is the best way to see Mt Everest and other peaks east of Kathmandu. A day trip of White Water Rafting to Trishuli be planned from Kathmandu. Trip could be custom made to suit novices as well as the experienced ones. Float on a raft through fascinating valleys, gorges, rolling rapids and pools. 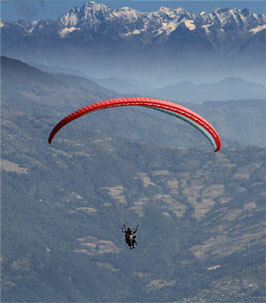 Tandam Paragliding flight with view of Kathmandu valley and snow peaks.